DVS Productions is back at Cowboys Dancehall! 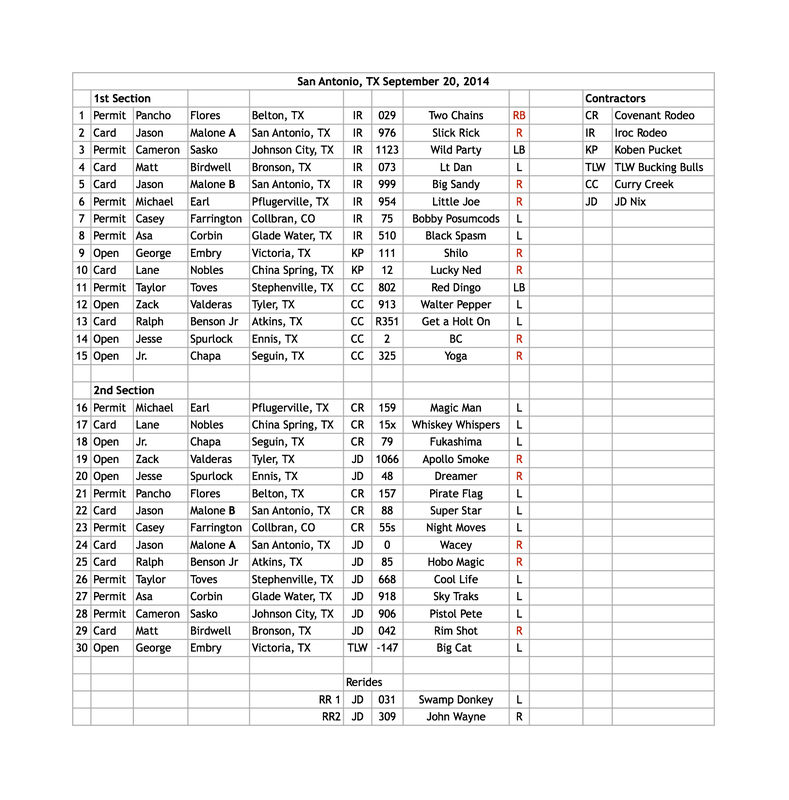 The PBR is rolling into the station at Cowboys this Saturday night, September 20 , 2014. Two sections: 8:30 p.m. and 10:30 p.m.
Jason Malone-currently ranked No. 39 in the BFTS, No. 3 in the Touring Pro Division and No. 1 in the BlueDef Velocity Tour. Jason has been burning up the Touring Pro Division this year and is a likely a competitor at next month’s 2014 PBR Finals. Michael Earl-young gun rider that can wow the crowd with his electric rides. Lane Nobles-the older brother in the “Nobles Boys” Dynamic Duo. He is currently No. 2 in the CPRA Bull Riding standings. Cowboys Dancehall is his “honey hole”…he usually wins big money at the club. 029 “Two Chains” IROC Rodeo Co.-last time this bull was bucked at Cowboys Dancehall Lane Nobles marked an 89.5 point ride. 802 “Red Dingo” Currey Creek Bucking Bulls-PBR World Champion Mike Lee was 86 points on this bull in August on his way to winning the BFTS in Thackerville, Oklahoma. R351 “Get a ‘Holt On” Currey Creek Bucking Bulls-PBR Finals Bull. Nick Volden has an event win at Cowboys Dancehall in 2013 on him. Lane Nobles on 15X “Whiskey Whispers”-I NEVER bet against Lane…especially at Cowboys Dancehall. The stat sheet shows that riders can get past the half-way point (4 seconds) on this bull. If that’s the case and Lane can get that far, I don’t have any doubt that he will seal the deal. Michael Earl on 159 “Magic Man”-Since this Spring, this bull has been ridden 3 out of 6 trips. For a cowboy that rides as good as Michael does, this should be a great opportunity to make a qualified ride on a solid bull. We may even see some “money chops” to mark up the score. Jason Malone on 0 “Wacey”-This match-up could be the “Ride of the Night.” Jason has been in a little bit of a slump lately, but those slumps never last long for him. We are also witnessing a re-match from November 2013 when Wacey bucked Jason off in 5.62 seconds. My call: Jason comes out of his slump this weekend and turns the buck-off experience from last year into a little fuel for revenge.